With tax season coming to an end in the next few weeks, taxpayers and the Treasury Department alike will be waiting to see the results of a pilot program for issuing refunds on prepaid debit cards. The program was rolled out to a limited pool of taxpayers this January. The program, which was introduced to 600,000 households, was intended to offer taxpayers an alternative to the controversial "refund anticipation loans." Since many low-income taxpayers don't have access to banks to cash tax-refund checks, a number of retail tax preparers issued prepaid debit cards to their customers loaded with the refund amount, minus fees and interest. And there's the problem. 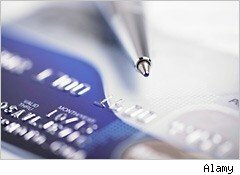 The IRS has been looking at ways to effectively put an end to the loans, but has also recognized that there are few other options for many taxpayers.The new Treasury Department-issued debit card would allow taxpayers to take advantage of the direct deposit program even without a bank account. In theory, this should mean taxpayers would shy away from the costlier retail loan options. "This pilot program will provide low- and moderate-income Americans with a low-cost option for faster delivery of their federal tax refund," said Deputy Secretary of the Treasury Neal Wolin. "This innovative card can be used for everyday financial transactions, such as receiving wages by direct deposit, withdrawing cash, making purchases, paying bills and building savings safely and conveniently, giving users more control over their financial futures." For the pilot program, the Treasury is issuing a prepaid debit card called MyAccountCard. The card is issued by Bonneville Bank out of Provo, Utah, and since it's backed by a bank, the FDIC insurance rules apply -- that means money on the card is insured just as it would be in a traditional bank account. Federal law also protects the taxpayer if the card is lost or stolen, unlike cash. Certain limitations apply and you will be required to pay a $4.95 lost or stolen fee for a replacement card. The debit card is a Visa. If the card is lost or stolen, the Visa® Zero Liability policy would protect taxpayers against any unauthorized transactions, so long as the theft is reported promptly. Unlike many of the retail card products, there are no overdraft and check-cashing fees associated with MyAccountCard. Cash withdrawals at 15,000 network ATMs are free. A service fee applies for out-of-network ATM withdrawals. The Treasury hasn't determined whether monthly fees will be attached to the card. During the pilot program, there will be several variations of the card, including some with monthly fees. The fee range will be from zero to $4.95 per month during the pilot program; those fees will be randomly assigned to taxpayers participating in the program. You can find a list of all the fees associated with the card on MyAccountCard's website. The normal rules related to refunds would still apply. That includes the right of the Treasury Department to offset the refund to satisfy a delinquent debt, including past-due child support obligations, tax bills and defaulted student loans. The Treasury Department likely won't have any firm data on the strength of the program for some time. Taxpayers, however, are bound to express their opinions before a final report comes out. How successful do you think it will prove to be?